There has always been a certain level of mystery surrounding the order of the Freemasons, which is considered the world’s oldest fraternal organization. Masonic symbols can be found in many places, most notably in the Great Seal of the United States that appears on the U.S. one dollar bill. Like most non-Masons, you probably recognize many of the masonic symbols without realizing or fully understanding their significance to the members of the Freemasonry fraternity. These symbols are worn by Freemasons in the form of masonic jewelry, most popularly masonic rings, which constitute an age-old custom for members of the Masonic fraternity. The symbol of the Masonic square and compasses is the most common and probably the most recognizable by non-Masons. The significance of this symbol is derived from the founders of the fraternity who were primarily stone masons or other craftsmen. Most rings with this symbol will also feature the letter “G” or the Eye of Providence (the same one on the US one dollar bill), which both represent the all-seeing power of God. This men’s masonic Blue Lodge 3rd degree freemason ring is a perfect example of these symbols and features them in 24K yellow gold. Most symbols featured on masonic rings are accompanied by at least one Latin phrase that points back to the Freemasonry ideology. 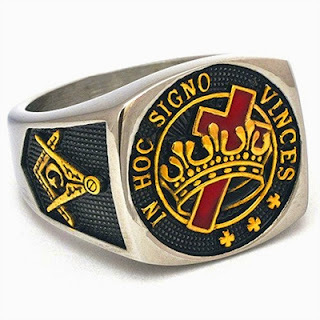 Featured on this Masonic Knights Templar Freemason ring, “In hoc signo vinces” has been roughly translated to mean “By this standard, conquer.” It is typically associated with the highest degrees within the York Rite Freemasonry. Another very common masonic proverb is “Aude, Vide, Tace,” which means “To hear, to see, to be silent.” Lastly, you will sometimes see “Virtus junxit mors non separabit” on masonic rings. It means “Whom virtue unites, death shall not separate” and is associated with the Lodge of Perfection, which is part of the Scottish Rite. 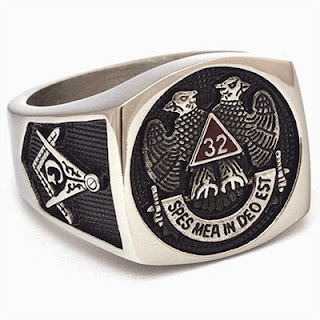 There are many theories as to why members of the Freemason fraternity wear these rings featuring their Masonic symbols. 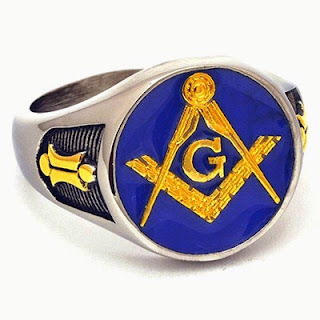 While the truth behind the traditions and secrets of the Freemasons can only be known by its members, the rings themselves are first and foremost a symbol of brotherhood. Much like a high school class ring or a wedding band represents the bond or commitment to a group of people or to another individual, these masonic rings represent the commitment to the fraternity and its ideals. See even more masonic symbols featured on keepsake rings at LovieArtJewelry.com.